Day 7: Mbabane to Sabi Sands - We left the opulent surroundings of the Royal Swazi Hotel with its manicured lawns and gardens for the short haul to the Kruger National Park via a very easy border crossing back into South Africa. Crews were given a detailed map and were free to choose their own route across the vast expanse of the safari park. For the adventurous, gravel and dirt roads led out into the bush. Elephants and rhinos criss crossed the road chomping their way through the scrub. Our day¹s drive ended when we exited the Kruger on its northern boundary only to enter a smaller game reserve, Sabi Sands. 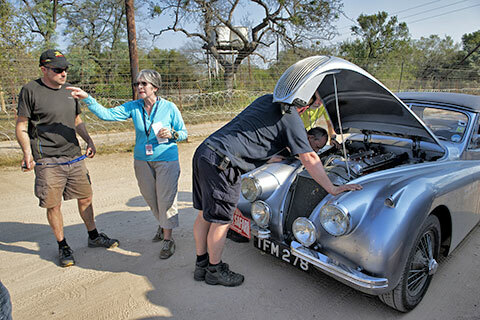 Only the Jaguar XK120 of Philip and Yvonne Haslam suffered any problem, failing to re-start at the gate of Sabi Sands. The sweep teams of Robert Kitchen, Tony Jones and Andy Inskip were quick to sort the trouble, even quicker when the Rally Director suggested the electrical coil would be the source of the bother if it was a Chinese replica of the original Lucas item... and sure enough, it wasn't bad fuel, a blocked filter, distributor issues or just overheating, the coil was found to have packed up. The driver had no spare, but the sweeps overcame that and soon had the Jaguar going again. How often does this happen? Just about on every event someone comes unstuck using these replica coils. At Sabi Sands the Rally divided into three, to lodge for two nights of unparalleled luxury in three different 'camps' - small individual chalets, set in the forest. After a buffet lunch we joined a fleet of open Land Rovers for a three-hour game drive. For the first time in a week, someone else was at the wheel and looking after the navigation. All three camps are truly excellent. Your correspondent is based at Kirkman's and on our game-drive we quickly discovered a pride of lions settling into their evening dinner of baby giraffe. We were able watch, hear and smell the visceral spectacle from a ringside seat just ten-feet away. Somewhat incredibly, the lions were totally unperturbed by a crowd of humans rocking up in a diesel Land Rover. We came across this animal several times as we threaded in and out of the thick bushes. An al fresco dinner, drinks and an open fire under a huge swathe of deep black sky peppered with millions of stars was waiting for us on our return. 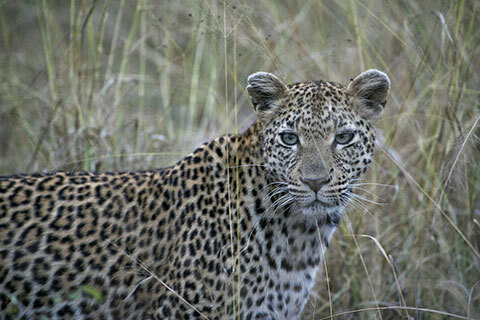 Day 8: Sabi Sands – Kruger National Park - Our first rest day - after a full week on the road. Terrific beds with large feather pillows, and no buzzing insects, meant we all slept soundly until we were woken at 5.15am for a second game drive. This again proved quite remarkable, with good sightings of elephant, hippo, leopard, zebra, giraffes and more yet more lions along with countless exotic birds. Our drive finished soon after sunrise with a full buffet breakfast served in a shaded clearing on trestle tables by an army of liveried waiting staff. The day is meant to be a chill out day with time for catching with laundry and sending postcards, but for the sweep mechanics, there's little time off as there is always servicing and fettling to attend to ready for when we get back on the road.